Image via WikipediaEmilio Salgari was born in Verona on August 21, 1862, to a family of modest merchants. When his dream to captain his own vessel and explore the world was shattered by poor marks at a naval institute in Venice, he turned his passion for exploration and discovery to writing. He wrote more than two hundred adventure stories and novels, many of which are considered classics. Setting his tales in exotic locations, with heroes from a wide variety of cultures, Mr. Salgari used his powerful imagination to bring the wonders of the world to the doorstep of generations of readers. Arguably the best selling Italian author of all time, Emilio Salgari is virtually unknown to the English-speaking world. Yet, like his adventure-writing counterparts Jules Verne in France and Henry Rider Haggard in England, Emilio Salgari was knighted for his contribution to literature. Salgari's imagination knew no bounds. His characters tamed the Far West, explored Africa, India, Australia and both Poles. But he is perhaps best remembered for his series of pirate adventures. Il corsaro nero is a swashbuckling tale of revenge set in the Caribbean that generated four sequels and a legion of imitators. Le tigri di Mompracem was the first in a series of eleven adventures set in the East Indies featuring Sandokan, The Tiger of Malaysia, a merciless pirate, who along with his band of warriors and his loyal friend Yanez ruled the waves of the Malaysian Sea. To this day, in Italy Sandokan is synonymous with Malaysia and his adventures have been the basis for comic strips, television shows and feature films. Though his characters achieved an almost immortal fame, and Mr. Salgari had millions of readers, he never attained the financial success and stability he deserved. His publishers, taking advantage of his poor business skills, left him almost destitute. Overwhelmed by creditors and family misfortunes, he committed suicide in Turin, on April 25, 1911. In one last act, drawn from his vast research and imagination, he slit his throat and stomach, in the ceremonial suicide of the Japanese samurai. But though the dreamer was gone, his books continued to sell and many owe their love of adventure, reading and writing to the characters and stories he created. Composers Pietro Mascagni and Giacomo Puccini were contemporary fans; later Umberto Eco and Federico Fellini would read Salgari to explore the world. Sergio Leone, one of the fathers of the Spaghetti Western, got his first glimpse of the outlaw hero in the pages of Mr. Salgari's books. Mr. Salgari is particularly popular in Latin America where he is seen as the first true anti-imperialist writer. Isabel Allende, Gabriel Garcia Marquez, Pablo Neruda, Jose Luis Borges, Mario Vargas Llosa and Carlos Fuentes all devoured his works in their youth. Che Guevara first read of boarding raids, jungle warfare and battles against injustice in Mr. Salgari's adventure novels. Guevara read 62 of Mr. Salgari's books causing his biographer Paco Ignacio Taibo II to remark that one could see that Che's anti-imperialism was "salgariano in origin." Salgari's works would have its effects on early silent films as well. Shortly after his death, the first adaptation of one of his novels hit the screen. 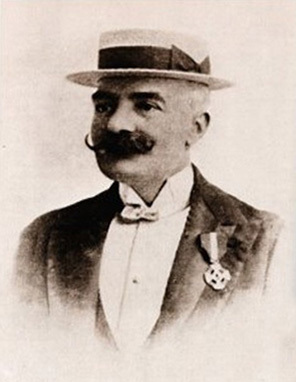 Directed by Giovanni Pastrone Cabiria was based on Emilio Salgari's 1908 adventure novel Cartagine in Fiamme (Carthage is Burning). Gabriele D'Annunzio was brought on board to help revise the film once it had been shot. D'Annunzio earned the title of screenwriter by altering the title to Cabiria, changing the name of some of the characters and rewriting the captions, using more grandiloquent expressions than those employed by the director. The three-hour movie with its grand proportions and cast of thousands created a sensation throughout Italy. It pioneered epic screen production and foreshadowed the work of D.W. Griffith, Eisenstein and others. Salgari, however, was not given credit until decades later. To avoid paying for rights, Pastrone attributed the source to a novel by Flaubert and to his own research. Modern film scholars and D'Annunzio biographers have since proven Salgari's connection to this Italian masterpiece. Just one of many adjusmtements and re-evaluations that would come to light in the late ninties. Though popular with the masses, Salgari was shunned by critics throughout his life and for most of the 20th century. Now Salgari's works are being revisited. In 2001 the Fabbri publishing house in Italy republished his entire works. The first issue alone, a new edition of I misteri della jungla nera, sold 100,000 copies. New translations have been published in France, Portugal, Spain and Latin America and with the recent translation of Sandokan: The Tigers of Mompracem, Mr. Salgari has finally been introduced to the English-speaking world. "My books race triumphantly throughout the world," Salgari once wrote to a friend. Almost a century after his death, his triumph still continues. Comments on "Emilio Salgari: Bio"